If you are looking for electric bikes Edmonton, look no further! The high-quality Pedego electric bicycles are available at Redbike in Edmonton. 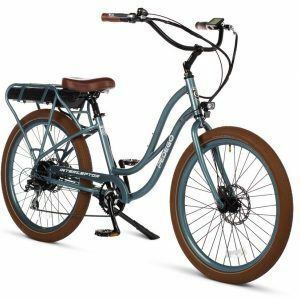 Pedego bicycles are quickly becoming the most recognizable brand of electric bike in Canada and around the world, and they are certainly number one in style and comfort! Take one of these great electric bikes for a test ride in Edmonton, Alberta, and find out why Pedego Electric Bikes are so popular. You’ll discover that not only will an electric bicycle get you off the couch and out of the car, you’ll also have a lot of fun riding one! The Pedego electric bikes available in Canada include the Boomerang Plus, which has an ultra-low step-through to make mounting the bike super easy. The bike also has all the same great features as the Pedego City Commuter and Pedego Interceptor including: pedal assist, a throttle, an LCD console, disc brakes front and rear, and an integrated light. The powerful 48V bike now also comes with two battery options: the standard 48V 10Ah battery or the 48V 15Ah extended range battery. If you are in Edmonton drop by and chat with the team at Redbike and take an electric bike for a test ride! We guarantee you’re going to have a lot of fun.